Born and raised in West Africa, this Master Drummer has played djembe for over 25 years, performing ageless ceremonies as well as working the Malian pop scene. While his hands move like lightning on songs like "Ngri" . it is Traoré's ability to mix and blend rhythms that makes his music take flight. In a village setting, these rhythms are played without breaks or transitions, allowing dancers to set the pace. Here two ethnic singers take the place of dancers by adding enticing vocal accents, sharing traditional Mande tales about the joys of children, farming accomplishments and remembering friends. One of the hottest drum recordings, ever! "This is a blazing hot, very high-energy recording of traditional Mali rhythms.The clarity of the recording is superb. Every note of every instrument is distinctly recognizable. There are songs sung on five of the seven tracks. The liner notes give detailed descriptions of the region of origin and cultural context for each track. . .
recordings of Malian jembe music, with some great jembe playing and arrangements." November is an exciting month for those of us who can't live without drumming. Jim McGrath who has fired our passions before with Soul Dancer, Drum Spirit and Percussive Environments, has just released Passport featuring The World Groove Collective. Musicians from all over the world bring us Senegalese Kora, Malian vocals, Hurdy Gurdy, Mbira, Kalimba, Flamenco Guitar, and Syrian violin along with fiery grooves from exotic drums. I'm betting you won't be able to sit still if your life depends on it. This disc demands that you get up and dance! is specific to a particular type of ceremony and ethnic group. Songs featured are played during all the rite and passages of everyday life, such as weddings, circumcisions, traveling in search of work and attracting a future mate. Assitan "tata" Sangaré and Fatou Keita are the featured vocalists, Terrance Nelson plays Dundun and kenkeni drums and the incomparable Moussa Traoré's djembe solos, dundunba, kenkeni, yabara, dundunden, nkenye, nkankan,and vocals are the powerhouse that drives the ensemble. Talking Drum approaches percussion from almost two opposite directions on these two strong new releases. Jim McGrath is a percussion alchemist, mixing an array of African instruments (congas, kora, mbira) with violin, cello, hurdy-gurdy, and flamenco guitar, among other instruments. The grooves, African at the core, are used as springboard for exploration into Middle Eastern and Gypsy territories. It all hangs together cohesively with little of the spaciness that plagues so many world percussion recordings. 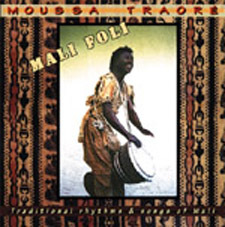 Mali Foli ("Rhythm of Mali"), produced by McGrath is the work of a traditionalist. Moussa Traoré presents seven ceremonial pieces from a variety of Malian ethnic groups in thier original forms, with call and response songs segueing into extended drum rhythms. Whiile the performances have the feel of a field recording, the studio production is excellent, allowing each instrument and voice to shine through. Together these two releases constitute a hearty mix of old and new. Moussa Traoré's Mali Foli: Traditional rhythms and songs of Mali will have you dancing with the first three notes! All of the music on this CD is traditional Mande music from Mali. Each rhythm and song is played for a specific traditional ceremony by a particular ethnic group. This Cd is an aspiring djembe player's dream, with its complex polyrhythms played by a true master. Traore's, djembe, dundunba, dundunden, kenkeni, shakare, nkrenye, nkankan and vocals are accompanied by Terrance Nelson on dundun and kenkeni and Assitan "Tata" Sangare and Fatou Keita on vocals. The rhythms are identified in the liner notes, so that the student may learn the difference between a "ngri", "sunu", "madan", "take", "jitimunka", or "senekefoli" rhythm. The meanings of each song and the type of ceremony it would be played in are explained also. I particularly loved the women's voices on "Bala Kononi" in which the women of the village are singing to young men who are going travelling. The women warn the young men that "in a strange place, people do not know your customs, so you must adapt to theirs in order to avoid problems." This is the music of passage like weddings and circumcision ceremonies, the music of the seasons like planting and harvest times, the music of celebration. It reminds us of what it is to be human and in relationship to each other. Loving, having children, living on the land, and caring for each other--these are songs with values we can all embrace. I can't recomend it highly enough!